When Gina Pierce and her husband David started house hunting for a large family home in 2002, they had a firm plan in mind. They were looking for a project – a house they could put their stamp on. The couple were happy living in Ealing, west London, and they eventually narrowed their search to 10 potential properties for viewing. The property was structurally sound. It was originally a family home but it had been converted into two flats, which were in a rather neglected state. The kitchen in the ground floor flat was tiny and housed in what resembled a lean-to. After looking at several properties – which included putting in offers on two houses, only to be disappointed when they were gazumped – Gina and David had a rethink about the first one. ‘It had everything we wanted, including plenty of space downstairs, four bedrooms upstairs, plus a large loft which could be converted,’ Gina explains. So they took the plunge, putting in an offer which was successful, and looked ahead to what would be a challenging but exciting renovation project. When they moved into the property in the summer of 2002, the first job on their to-do list was to create a larger kitchen. They planned to knock through the wall between the old kitchen lean-to and breakfast room and extend to create a spacious kitchen-diner. ‘It had to be tackled first, because the kitchen was basically quite grim – I didn’t want to prepare food in there,’ Gina recalls. Fortunately, the kitchenette in the upstairs flat was perfectly useable, so Gina cooked the family meals there for three months during the build, managing with a two-ring stove. The back garden also needed immediate attention because the entire space was exposed to people passing by. The couple had new garden fencing erected, while a large shed was built on the site of the former garage. Now that the house felt more secure, they tackled the garden, cutting back all the dense undergrowth and introducing new planting and features. In the meantime, work continued on the kitchen extension, which was completed when a 1950s-style high-gloss kitchen was fitted. However, Gina and David soon realised that they had made a mistake. ‘Once we finished the garden, we could see how much it had influenced the design of our new kitchen-diner, as we’d fitted two windows looking out to the garden instead of french windows because it had felt so exposed before,’ Gina admits. As the garden matured into a thriving space, the couple felt hemmed in whenever they were in the kitchen-diner as it was casting shadows, so they decided to remedy it. The house was built in 1916. Its timber flooring throughout was pretty solid but needed to be sanded and re-varnished to restore it to its former glory. Other period details, such as fireplaces, were restored too – apart from the living room’s 1930s fireplace, which was ripped out as it was badly chipped. The couple kept the remaining fireplaces in the four bedrooms because they were still in good condition. ‘David and I tend to do things in stages then we take a rest in between,’ says Gina. ‘A few years ago, I drew up plans for a garden redesign and commissioned The London Garden Design Company to do the work. ‘It has been redesigned to include an ornamental pond and a new lawn area with a path connecting it to the main part of the house – we love it,’ she adds. The couple’s major project came in 2004, when they decided to convert their loft. They planned to convert it by extending it across the entire width of the house. When the plans were submitted to the local authority for approval, however, they were refused planning permission, because it was considered too ambitious. Instead, Gina and David were allowed to convert the existing loft space into a large master bedroom with an en suite. The couple called in local loft conversion company Scott McCabe Associates. They decided to add a dormer window with a balcony to create more light and suggested borrowing space from the large landing to make way for the new staircase. Scott McCabe Associates agreed it was a practical solution and the conversion work went ahead. Once all the renovations were complete, Gina and David started on the furnishings. The living room sofa is a good example. Originally a 1920s piece belonging to Gina’s mother, Gina re-upholstered it and teamed it with two 1970s Parker Knoll chairs, which she covered in one of her own fabric designs. 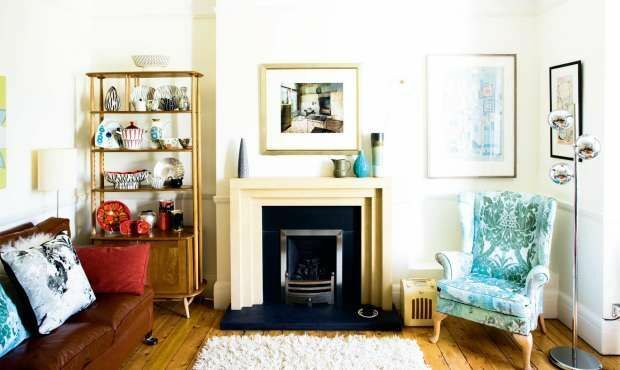 ‘I like houses with individuality, which are furnished with pieces that no one else has in their home,’ says Gina.